First of all, a big thank you to everyone who tried our demo! Especially those of you who posted videos of it, whatching you play this game we have been spending our lives on for months was a blast, and it really helped us understand how to improve it! We heard you loud and clear : gamepads are here! 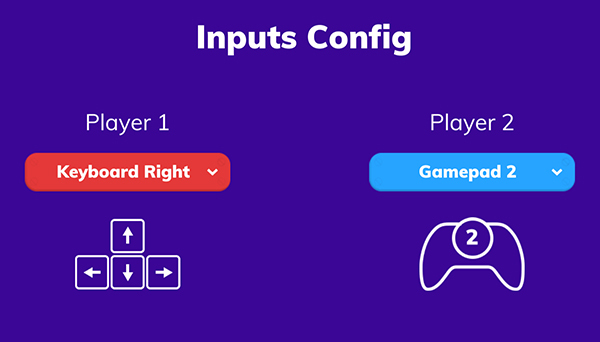 You can choose your controller to play with gamepads, keyboard (WASD, ZQSD or arrows), or even with your mouse (made possible by our 3 button gameplay). The input system was already ready for the complete version of the game, but our original intent was to make the demo as simple as possible with prechosen keyboard controls, everything already ready to play. But seeing people play made us realize that even on this demo, playing with gamepads could be essential to the experience. So we added a simple little menu at the begining of the demo to make this possible (on windows build only, as this is a bit more complicated for WebGL). After all, we are called Couch Game Crafters and our goal has always been to make games you can play on your couch with of a couple of gamepads, so here you go! 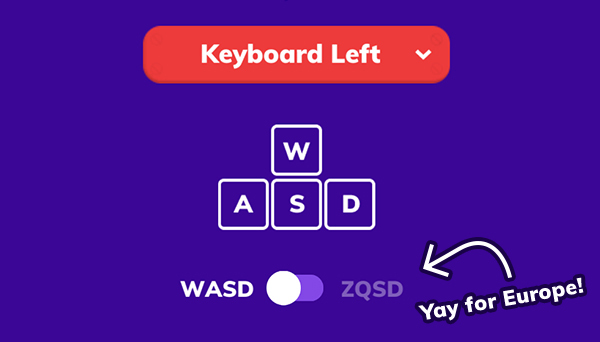 Even for this early demo, we decided to go the extra mile and add a little switch for our friends in europe with AZERTY keyboards, to avoid the hassle of changing keyboard layout. We live in France so this is really to make sure our friends and family could play easily (You’re welcome, mom and dad). We added a couple of variant that will pop up randomly to add some variety to the gameplay. There are only a few ones right now, including “Dual balls”, “Mini Toasters” and “Pong mode”, but the idea was really to put in place a system that would allow us to easily implement more variants as the development goes on. We spent a bit of extra time on a probabilty system that would be easy to work with, and that would allow us to make sure that some variants don’t repeat too much, to make the game experience as varied and balanced as possible, while keeping that randomized factor. Try it now and see if you can discover all of the current variants ! One of our variants is a retrostyle pong mode, with a no-gravity ball, immobile toasters and a nifty little image effect shader that we made to really sell that retrowave style. Thanks for checking our game, hope you like the update, have fun! First up - fantastic demo. I have a little indie game tournament thing I run at work and Toasterball is a hit. I had it 2v2 (each player controlling a single toaster slot) which is not quite intended play, but we made it work. We played before the update and after and want to give a bit of feedback on the variants. Everyone loved Toaster Pong - it was by far the favorite variant. No bread and tiny toasters felt like interesting ways to play. Double ball was a bit random and frenzied and more random than the others, but generally more enjoyed than disliked. The one variant that most players were frustrated by was large toasters with no toast, mainly because the doors were barely higher than the toasters. This meant the primary strategy would be to shuffle the gigantic toaster back into your goal and stay there. It was very difficult with no toast to attempt to aim the ball at the opponent's button and single points lasted a long time and became a bit uninteresting. That's all! Keep up the good work. The game is a blast and seeing the experimentation in the variants was overall very exciting.